If you live in Greensboro, you probably know Judy at our office. She is terribly charismatic and has never met a stranger. At the office, we refer to Judy as “The Bun” because she keeps everything in our very chaotic office together. We all have corresponding names, but she is the only one that we call by nickname. I’d write more about how about the Bun but she will probably protest. I’d like to stay on her good side. 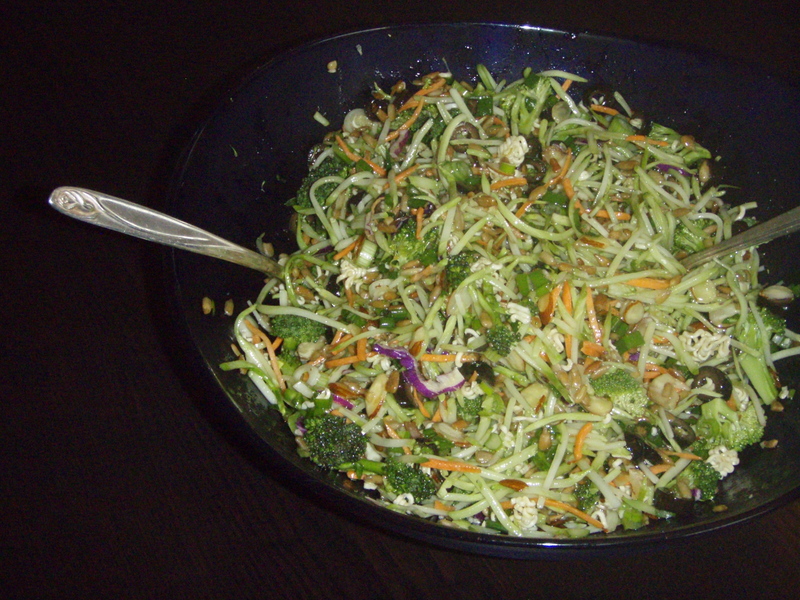 Over the past couple years, the Bun has made her Brocoli Salad for office celebrations and the liking. I had always told her how much I loved it but never asked for the recipe until recently. I made the salad as a side for my kickball team BBQ this past Sunday. It was not only super easy – but a great BBQ side and everyone seemed to enjoy it. When I told my mom about the recipe (I was telling her how strange I thought it was considering you use the ramen seasoning mix in the dressing) she commenting saying “That sounds very healthy.” I told her it was until you dress it with a half cup of sugar. Masha commented saying at least you get the nutritional value of the vegetables! Either way, c’est le vie! Assembly: Mix the first 7 ingredients together (set aside the ramen seasoning mix). In a jar, mix seasoning mix, sugar, vinegar and olive oil. Dress the salad right before you serve it. My friend gave me a very similar recipe, using beef ramen instead of chicken, and switch out olive oil for asian gingers sesame type salad dressing, and cranberries for olives. It’s tangy greatness! I am moving to Greensboro this summer, and I love to garden and cook! Happy I ran across your blog.